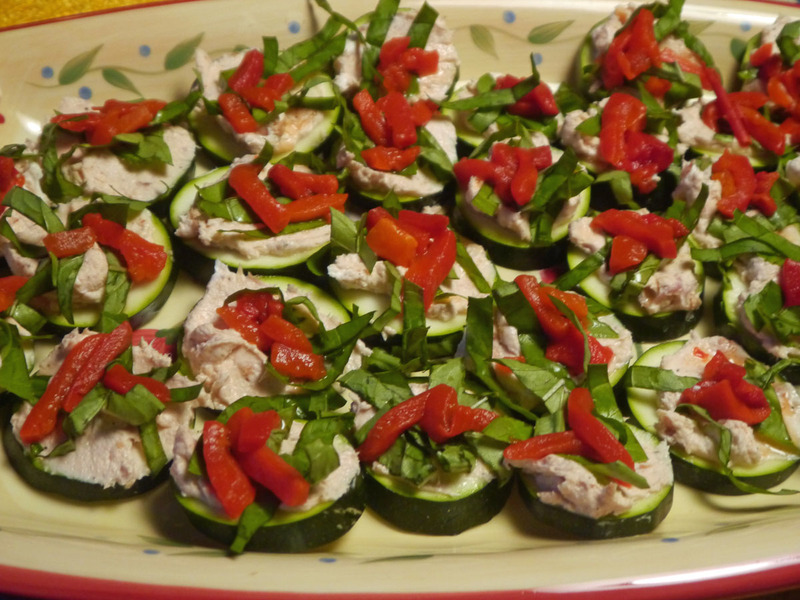 This is a quick, delicious, summer appetizer that I came up with. We’re always looking for new uses for zucchini. I will usually make this from the first zucchini off the vine and it celebrates the beginning of the summer bounty. Quantities are approximate and of course it all depends on the size of your zucchini and how much salmon you have. Seasonings are of course to taste. Shred the salmon with a fork into a small bowl. Add enough cream cheese to make a spreadable mixture. Season with garlic powder and paprika and mix well. Slice the zucchini into 1/4 inch rounds. Spread with the salmon mixture. Top with basil and 1 or two pieces of red pepper. Smoked salmon is a staple of our diet and is the primary food that I make in my smoker. This is a quick recipe for a delicious spread that can be used on crackers or thinly sliced french bread or probably even as a vegetable dip. I used smoked chunk salmon in this recipe as opposed to the thinly sliced Lox that you would put on a bagel, but that would probably work, too. I just haven’t tried it. Blend all ingredients thoroughly with a spoon. Chill to let flavors blend. Serve on crackers or thin slices of baguette. You can use mayonnaise instead of cream cheese in case you are avoiding dairy, or happen to like that flavor profile better. Add enough to hold the spread together, probably about 4 oz. Jared got this one from his friend Denise McCarthy. It is wonderful not only on Salmon, but on chicken and other meats as well. Lightly coat meat or fish with Olive Oil. When I got my first smoker, probably in the late 1990’s, I went over to see my backyard neighbor, Dudley Welch who had been smoking fish for quite a while. Dudley had a marinade recipe that he swore by, from his son-in-law, Dan Janssen. Dan is a trained Chef and now owner of a Barbecue restaurant in Kansas City, so I figured the recipe must be good. It is. I get lots of requests for my smoked salmon even from people who don’t like salmon. Yield: Whatever you can fit in your smoker. Marinate the Salmon for an hour or so and soak your wood chips in water for about the same time. Rinse well and dry with a paper towel and cut into 4 to 6 inch pieces. Spray your rack with cooking spray or oil and arrange the salmon on each rack leaving space between the pieces for the smoke to get through. Sprinkle the salmon heavily with fresh coarse ground black pepper and let the salmon air dry for 20 minutes or so. A sticky coating will form on the salmon that helps absorb the smoke flavor. Get your smoker going and put the soaked chips on the hot coals or in the wood chip basket. When the chips start producing good smoke, put the fish into the smoker. I typically smoke the salmon for 2 hours at a temperature of 200 degrees. All smokers work differently and you'll need to experiment for optimum results. The smoking time is less in the summer when it's hot out than in the winter. I get my best results with hickory chips, but again you'll need to experiment. I've smoked White Bass in this same manner and the results were excellent, although the smoking time was less as the filets were thinner.